#246: The Secular Radio Hits | mark Joseph "young"
This is mark Joseph “young” blog entry #246, on the subject of The Secular Radio Hits. I suppose we can call it one of the weird side effects of the Jesus Movement, that there were a few songs that made it on popular secular radio that people thought were Christian. Most of them were not, but they are worth a quick look. Although many Christian artists have covered it as a song about Jesus, James Taylor’s You’ve Got a Friend is entirely about human friendship. That’s not a bad thing; it’s even a Christian thing. However, it is not a Christian song, but a song written (and originally recorded) by Carole King, in response to the line in Taylor’s Fire and Rain about not being able to find a friend. Paul McCartney has said that The Beatles hit Let It Be probably would not have been half so successful if it had not been that coincidentally his own mother’s name was Mary. The religious connection is read into it by the hearers; this was just advice that his mother had given him growing up. Alan Parsons, whose The Alan Parsons Project song Eye in the Sky was their greatest hit, has complained that his lyricist Eric Woolfson writes terribly obscure lyrics. This song is about dropping a lover, and reportedly heavily influenced by Woolfson’s obsession with the ceiling cameras in casinos. One of the great rock classics which was never released as a single but makes great popular songs lists anyway, Led Zeppelin‘s Stairway to Heaven seems on its face to have something to do with, well, getting to heaven. It probably does, but not in any Christian way, the composers being influenced by writings about supposed ancient Celtic magic. You can be excused if you think Norman Greenbaum’s biggest hit Spirit In the Sky was a Christian song. Unfortunately, Greenbaum is Jewish, from an Orthodox family. He wanted the song to capture the imagery of the westerns on which he was raised, the notion of “dying with your boots on”, and he says he used Christian imagery because he had to use something and that made sense in the setting. Kerry Livgren was asked whether Kansas‘ Dust in the Wind was a Christian song. He says not really. It was written during his search for meaning, which he documented in his book (co-authored by Kenneth Boa) Seeds of Change. I read the book decades back, and remember only fragments, but Livgren became a Christian, and Kansas started doing songs with lyrics Christian enough that vocalist Steve Walsh was uncomfortable and left the band, to be replaced by John Elefante. Eventually Livgren and Dave Hope left to form AD, and after the band dissolved Elefante reportedly had a career as a CCM soloist I never heard, and to serve as producer for several Christian rock bands I did. I think Livgren also released a solo album, but I don’t remember it. One other song will be mentioned here, because it made #3 on the pop charts in the U.S., #1 in Canada, and was a genuine Christian song. 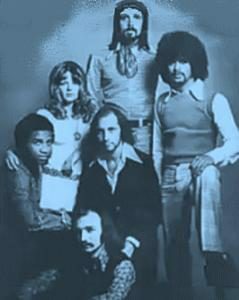 Ocean (pictured) is usually identified as a Canadian Gospel band, and although Put Your Hand in the Hand was a cover it was their version of the song which was heard by most people. Unfortunately, the business side of the business cheated the artists of a lot of money, and they gave up on the music world without producing another hit. So in conclusion the Jesus movement did have some impact on putting Christian music on secular radio, but not really all that much. Oh, there eventually was more, but we’ll get to that. Pingback: #250: Original Worship Leader Ted Sandquist | mark Joseph "young"